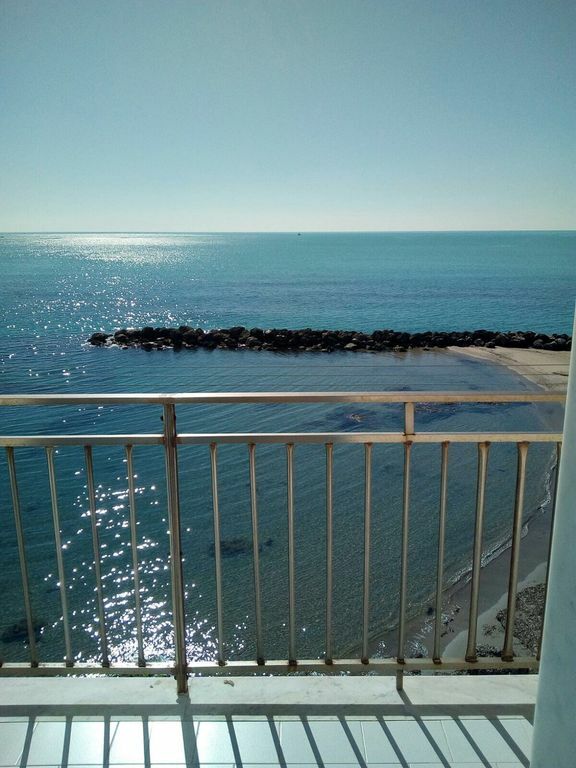 Apartment on two levels completely renovated, direct access to the sandy beach. On the second floor we find the large bright living room, kitchen, bathroom and balcony, in the sleeping area there are three bedrooms, walk-in closet and bathroom. Going up the stairs you enter the large 140 sqm terrace with stunning views in a charming and unique place where the key words are: "sea and relax." above the apartment is the wonderful terrace for exclusive use where you can admire unforgettable sunsets, dine by candlelight and hear only the sound of the sea. Lovely spacious apartment with amazing views. Great balcony and roof terrace. The girls loved being on the beach which we largely had to ourselves! Supermarket a couple of minutes walk away and only 15-20 minutes walk into town. Bellissima vacanza ! Appartamento sul mare , comodo attrezzatissimo e molto pulito. Grazie!!!!! La proprietaria è molto disponibile e gentile. Ciao Domenica sono molto contenta che vi siate trovati bene.Un caro saluto a tutti voi. Apartamento super grande y recien renovado. Terraza espectacular. Interior del apartamento espectacular. Espacioso. Recien renovado. Salón/cocina muy grande. Habitaciones comodísimas. La terraza-ático es tambien grandiosa. Mesa muy cómoda para comer o cenar, muy grande. Acceso directo desde el piso de abajo a la pequeña playa de arena justo en frente. Dormir con el ruido de las olas es un lujo. Un supermercado a 10 minutos a pie. Zona muy tranquila. La limpieza exquisita! Mónica es una excelente propietaria. Die Wohnung am Rand von Sciacca im 2. OG eines Mehrfamilienhauses direkt am Meer und mit großer Dachterrasse ist sehr geräumig und großzügig modern möbliert. Der Blick aufs Meer ist phantastisch und die Küchenausstattung ist - mit Ausnahme des Backofens - hervorragend. Ein fehlender Sonnenschutz auf der Dachterrasse wurde nach Nachfrage sehr kurzfristig installiert; für den Balkon gab es leider keinen, was die Benutzbarkeit (pralle Südseite) sehr einschränkte. Weitere kleine "Tücken" waren nur lauwarmes bzw. zu wenig Duschwasser und fehlende Bettdecken (es gab nur Leintücher). Für die Gesamtbewertung ist für uns allerdings das direkte Umfeld noch wichtig; der direkte Strandzugang ist zwar vorhanden, aber der Strand ist leider vermüllt und die Umgebung macht insgesamt einen aufwertungsbedürftigen Eindruck. Von den Entfernungen her ist zu Fuß viel zu erreichen, allerdings sind die Wege nicht unbedingt attraktiv und fußfängerfreundlich. Wir waren mit 4 Erwachsenen vom 3.10.2017 - 12.10 17 in der tollen Wohnung. Traumlage diekt am Strand in ruhiger Lage am Ende der Straße. Riesige Dachterasse mit Duschen. Einkaufsmöglichkeit in der Nähe und auch Restaurants mit frischem Fisch. Der Hafen ist ganz in der Nähe. Zur Stadt Sciacca etwa 20 Minuten Fussweg. Gute Ausgangslage für viele Sehenswürdigkarten in näherer und weiterer Umgebung. Es war ein sehr schöner Urlaub. Seaside town and famous tourist destination SCIACCA is a beautiful Sicilian town where you can enjoy sunsets and romantic atmospheres. Surely it is a sight for the eyes to visit its ancient palaces and its beautiful churches. Sciacca is a renowned seaside resort and hydrothermal center that attracts numerous tourists from all over the world. The Sciacca sea has very fine sand and a typical Mediterranean scrub habitat. Among the most popular beaches, there are Torre del Barone and the Capo San Marco Nature Reserve. Sciacca is a very lively and pretty city and for the lovers of night life on the seafront there is no shortage of restaurants and entertainment. The city is famous for its handicrafts, in particular hats and products for the ceramic kitchen and for the culinary specialties, the Cucchitelle and the tabisca saccense.